Me too. In fact, just the other day, I was stuck in Target waiting endlessly for a prescription to be filled when I remembered that my Nintendo DS was in my purse. I carry it around for times just like those. Of course, I had my favorite game loaded in the DS: Zenses Ocean. As soon as I began playing, my tension was eased and the time just flew by. I also suffer from insomnia and the game helps me to relax and unwind at night. The music is so soothing and the graphics take you away to another world. The clean, fresh look as well as the calming soundtrack reminds me of a spa getaway. Click here to see the trailer so you can watch and listen for yourself. Allows players to escape from the stress of daily life while challenging the mind, body and spirit through relaxing puzzle games, soothing ambient sounds and authentic rainforest and oceanic visuals. Designed for casual play – whether it’s for three minutes or for a three-hour escape – and offers a collection of six easy to pick up, yet addictive puzzle/brain games that are as fun as they are challenging. A clean, fresh and “spa-like” interface and highlights the earth’s natural wonders and beauty. A pleasant mixture of 2D and 3D. Zenses is controlled using the stylus only. Not a single key press is necessary. Includes a high-quality, ambient soundtrack. Music from the game can be downloaded for free. Just click here and go to "Music Download." Zenses Ocean transports me to my favorite place on the earth....the beach. The puzzles are "inspired by the movements of the tide, rippling water, riffs and corals, beach vegetation and sea life." "An indulgent, soothing experience, Zenses Ocean includes high quality visuals and ambient sounds inspired by the natural sounds of the sea. 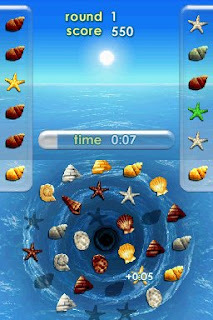 Subliminal addictive puzzles such as Zen-Stones, Hot Spot, Shell Twirl, Turtle Turn, Pearl Diver and Wave Breaker were created to give players an escape from the stress of every day life." Ahhhh! Just what my busy mind needs to unwind. Shell Twirl is my favorite puzzle. There's just something soothing to me about dragging all of the pretty shells into their rightful places. For more information on Zenses Ocean, click here. While you're there, don't forget you can download the spa-like music for free. You can also click on "Words of Wisdom" to view inspirational quotes. Would you like to release the stress and tension in your life and have fun while doing it? Thanks to GameFactoryGames and r-west, one lucky reader will win Zenses Ocean for themselves! To enter, simply leave a comment on this post letting me know why you'd like to win Zenses Ocean. ~Twitter with a link to this post. Then leave a separate comment here with your Twitter link. ~Blog about this contest with a link to this post. Then leave a separate comment here with the link to your post. ~Follow this blog. Simply click on "Follow this blog" found near the top of the sidebar to the right (under "The Blonde"). Then, leave a separate comment letting me know you are following. Be sure that there is an email address for you that I can find, or your entry will have to be disqualified. By entering, you automatically agree to all the rules and disclaimers listed here. Deadline to enter is 11:59 EST, Saturday, February 21, 2009. Winner will be selected at random using Random.org. Good luck! I'd love to win this. I'm a type A, coffee addict, full time teacher, part time college student and single mother of a 15 year old boy..the last one being the most stressful.....This would be such a pleasant distraction. it looks like it would be a lot of fun and I would enjoy it! I've added you to my favs on Technorati. It would be so refreshing to play this game with the relaxing sounds. I would like to win..to help me relax! Would love to win this for me and my kids! Thanks! I love to win this, because I just bought my girlfriend a DS and only bought one game so far...(Animal Crossing) and would like to give her another game to play. I also suffer from insomnia, and this game would likely relax me and put me out! cdziuba: http://tinyurl.com/czc58l Cool game giveaway. OOH-I just got a new Nintendo DS and have no games for it yet. This would be perfect. Thanks for the giveaway. This game looks like fun--and I am getting tired of the one game I have for my DS. Thanks for the giveaway! I am so stressed over money that I keep a constant tension headache. Maybe a Zenses game would take my mind off my troubles and help me relax enough to get rid of the headache. I am a mom of two grown men, who I am constantly worrying about,one of which is a cop,and the wife of an ex military man who has countless health problems from his tours of Bosnia. I really need something to help me relax. I think this would be a fun and relaxing game! Finally a game I NEED! lol! Maybe this could help me relax. I hope I win! This sounds like the perfect game to unwind with! anythign to help me relax! I'd like to win because I really enjoy the relaxing games--I've tried Clubhouse Games & CrossworDS and would like to try this one! Thanks for the contest! My daughter just got a DS for Christmas and this looks like a perfect game for her and I to enjoy together. It sounds fun and relaxing. I need to chill out. Relax. Please accept my entry. Thank you. This would be great for my daughter who has a very stressful job. First off, momma doesn't have a game of her own to play on the new DS we got for Christmas so this would be a real treat for me. With 5 kids (6 if you count my husband...) I could very much use some relaxing time everyday. What a great prize. Thanks for the contest. Please enter me in this contest.I am a subscriber. It would be a lot of fun. I would love to give this to my teenage daughter. She is a 40 year old in a 13 year old body. She needs to relax and unwind and stop worrying about everything!!! Looks fun and I need to relax!! It would be fun to have a game that also relaxed me. I want to win because I love puzzle games! the sounds would be heavenly. My friend can't wait to own a Zenses, and I can't wait to win one for her. I'm-a wishin' and a-hopin'! I love my ds and a game made more for adults would be cool! I'd love to win this to help De-stress after a crazy day of teaching. It really looks like a fun game! I love the concept of Zenses Ocean. It would help me feel relaxed when I am stressed. oh please girl... lol... you've seen me on Facebook at 3am and 4am and even 5am :-) I think you already know why I need to win this game, lol. Thanks for another great contest! I'm going to twitter it right now! With 3 young children this would be wonderful to relax with when they go to bed at night. Thank you for a great giveaway! To give me something to do while DH plays his Xbox and my son plays with his toys. Momma needs a game too! Brain age isn't exactly relaxing so I'd love to try this. Thank you for the giveaway! I love the soothing sounds and visions of the sea. this game sounds like one that offers both, it sounds great! i love to play games but i hate violent games. so i love the soothing game sounds for this game. We drive 67 miles to my sons sporting events every weekend. I would love to play while my husband drives. I am a casual gamer. Sometimes it's nice just to relax after a stressful day with some fun videogames. Zenses Ocean looks perfect. Thank you for the chance to win. I'd like to win because I like puzzle games and I really need to relax. This sounds perfect for me! This game looks like a great addition to the Nintendo DS lineup. I would love to try a game with this type of mixture. A relaxing game you can pick up and play anywhere with great music and wonderful puzzles. That's just the tip of the iceberg. I am extremely stress with starting a new blog, starting college again, and my grandma being sick! I could so use this to calm down! 1. I got a Nintendo DS for Christmas. 2. I really need to find new ways to relax! Some of my fondest memories involve the ocean and the beauty of nature. I would love this ocean themed game to destress. I'd love to win this as I got a DS for Christmas and I've been decreasing my brain age, working with my weight loss coach and learning spanish, but I don't have any relaxing games, this sounds perfect for destressing. Thanks for a great giveaway! I'm a blog follower, trishden! This would make a nice gift for my nephew. I love the rain forest game, and like the ocean theme to this game. I would love to win this because I'm about to go on a trip, and would love a new game for the plane. I love puzzle games and can realy use a excape! I would like to win because it sounds like a relaxing way to unwind after a stressful day. I'd love to win this so I might be able to relax every now and then! I would like to win because I need to relax! i'd like to play something other than Mario and Zenses looks pretty good. from what i can tell the graphics are nice and sharp. plus i love puzzle games. thanks for the chance! This looks like it would be calming. That's something I could use right now. Because I love meditative relaxation. We saw this game at the store, and I held it up and my kids made faces at it...so I want it SO badly. The kids said it is UN-exciting, so that means it would be mine, all mine! This game looks so relaxing. Would love to have it for when I am strssed out which is pretty often. I'd love to have Zenses. My son hasn't been playing his DS since he got the Wii. Now I'm addicted and I could use a new game! This game looks so great! What parent would not want this game to unwind while the kids are away? I'd love to win this, it looks relaxing! I'd love to win this. The ocean is relaxing and the games look cool. I entered a gazillion sweeps to try and win this because I am stressed beyone belief. This game looks very relaxing. It would be nice to play this on my Nintendo DS right before bed! :) Thanks for the contest. As a mom of 4, this would be IDEAL for me. I love puzzles too and can easily get lost in concentration in a game like this. I hope I win and thanks for the contest! I would love this because I could really use some de-stressing right about now. Thanks! Playing 'Zenses Ocean' would be a great way to unwind after a looooooooooooooooooog week at the office! Please, include me in your giveaway drawing! Thanks and good luck to all! I would like this to de-stress! Oooh, I love puzzles of any kind. This looks like so much fun (and relaxing). Thanks for the giveaway! Now that sounds like just the game for me. A nice way to unwind after a hectic day of teaching third grade! This would be a great game to play, while waiting at the bus stop! I would love to win the DS: Zenses Ocean game. I love the beach. And I need a game that will melt all my tensen and stress away...right now I have Brian Age for the DS and I get stressed out when the doctor guy tells says something like "Are you feeling tired" when I post a not so good score. I need a good stress reliever. Thanks for the chance to win. After working 8 hours a day, 6 days a week I need something to help me relax and unwind. This sounds like the perfect game. This sounds like a game that parents need to relax after a long day of running after the kids. I hope I win! I need a little escape to relax before dragging myself into bed. This looks like a fun game. Please enter me. I love that you can play this for a few minutes at a time. A little bit of stress reduction here and there would certainly be a plus in my life. 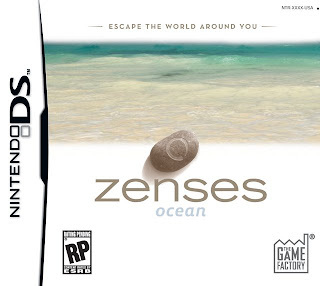 I'd like to Zenses Ocean so that I can have an excuse to play with DS and to finally have some relaxing me time. The game seems challenging, mind boggling, and serene all at the same time. I would love to win the game because it sounds like it would be something that both my grandchidren and I would enjoy playing. I love the ocean and I've had a lot of stress lately. I would love to play something that's calming. The game sounds fun. Also I need to relax and take some time for myself. I would love to win. Thanks! I would like to win this to help me ease the stresses of life! My daughter wants this game! I have been wanting this since I first saw it. I need something to help me unwind and this would definitely do the trick....Thanks for the chance. I'd like to win this because things have been stressful the last few months and something relaxing would be nice. I FEEL SO STRESED OUT SOMETIMES. OTHER GAMES SEEMS TO MAKE ME MORE STRESSED. 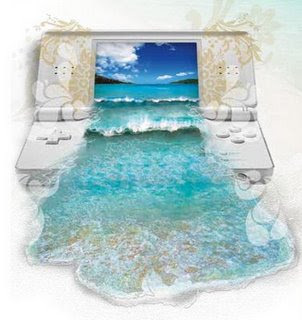 ZENSES OCEAN SEEMS LIKE IT'S RELAXING YET GIVE MENTAL SIMULATION IN ORDER TO EXERCISE YOUR BRAIN. this seems like such a cool stress reliever! the game sounds relaxing and fun to play! I would love to win this game, Being at home almost 24/7 with kids I need a bit of relaxation! What an innovative game. It's nice to see something aimed at moms. Zenses Ocean looks like it would be so relaxing. i got rid of my old nintendo ds, so i got rid of most of my games as well. i still have a couple, but i need to build up my game library! zenses ocean looks really amazing, i love games based on ambient sounds & puzzles as well. this game combines so many great concepts all in one! also forgot to say that i got rid of my old ds, but i just got a new one... i realized i couldn't live without it! its such a cool little device! also check out the link above for your button which i just added. thanks for the great contest! I would like to win Zenses Ocean because it sounds very interesting! Our school had Oceans for a theme several years ago and my daughter has remained extremely interested in our oceans. I added you to Technorati Favorites.